This is a tattooed woman with way too many necklaces. 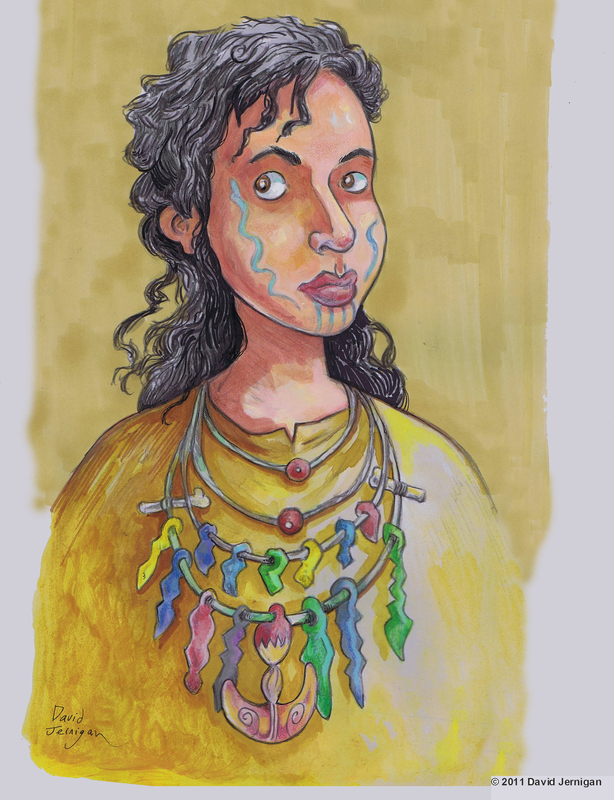 I created this sketch with colored pencils, watercolors and markers. I created a monster that referenced Aztec legends. 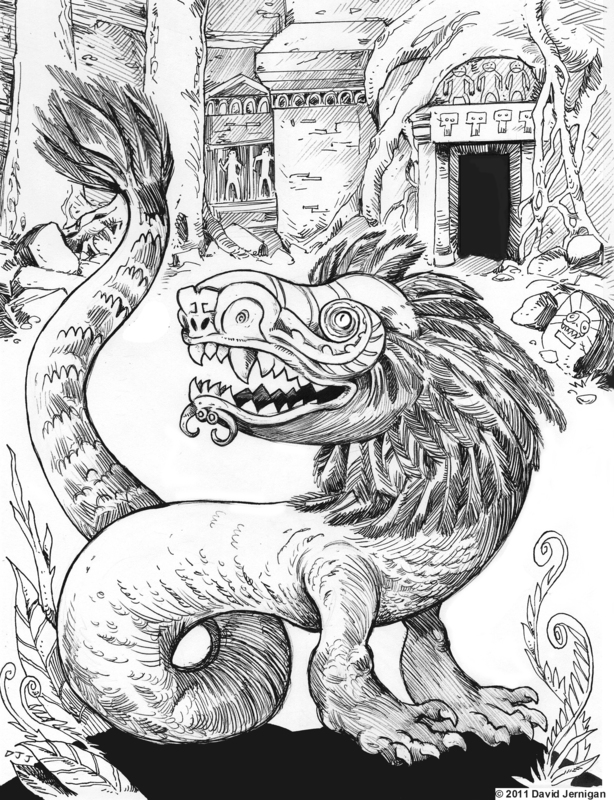 The dangerous looking beast is a feathered serpent monster like Quetzalcoatl. This sketch is another one in a series I did for a friend’s project. This sketch is from my visit to the Monterey Bay Aquarium. 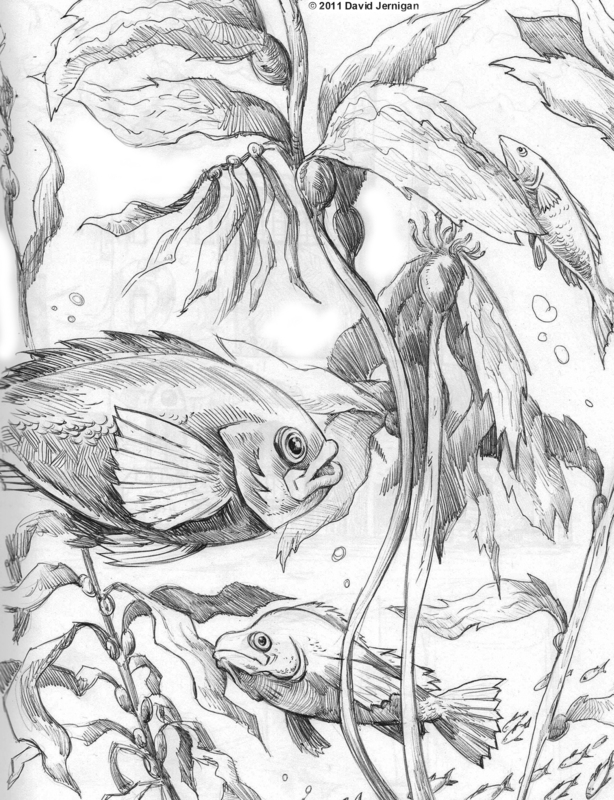 The underwater kelp forest exhibit at the aquarium is amazing and while I was there, I sketched some of the fish as they hovered and swam through the kelp blades. This sketch was inspired by a giant crab idea a friend of mine had. I drew two different head design concepts below the main picture (hence the floating heads). This monster is definitely not whimsical but more frightening. This sketch is another one in a series I did for a friend’s project. 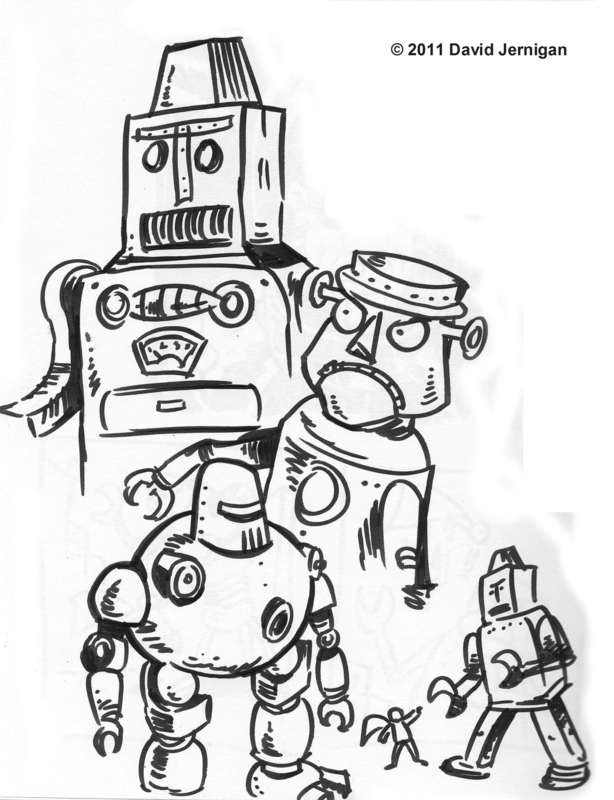 This sketch is of a retro robot design I was mulling over. The design is for a color illustration I am currently working on. I wanted a robot that looked like it belonged in the age of rayguns, Sputnik and President Eisenhower. I drew these character sketches during a meeting at school. Frida Kahlo has her unibrow in all its nonconformist glory. Vincent van Gogh looks a little grumpy. 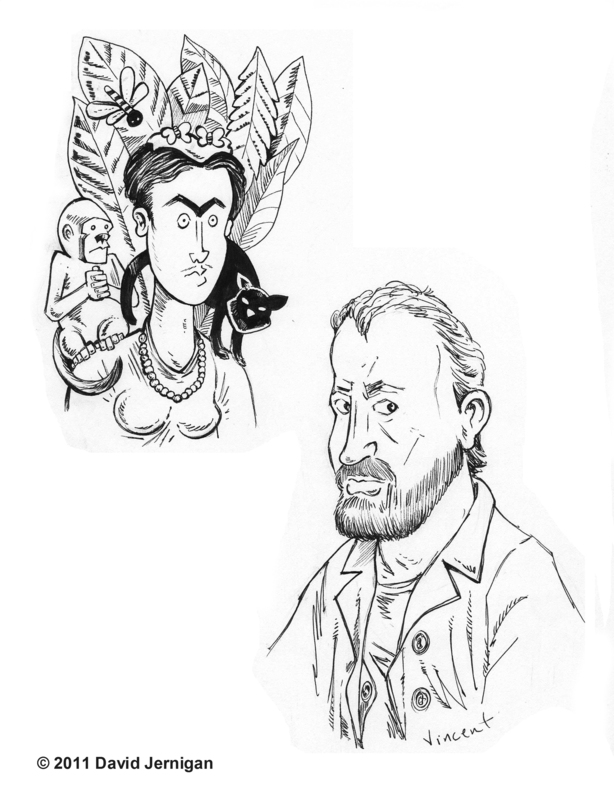 I think I was a little grumpy when I sketched these two famous artists. I always have had a fascination with monsters. 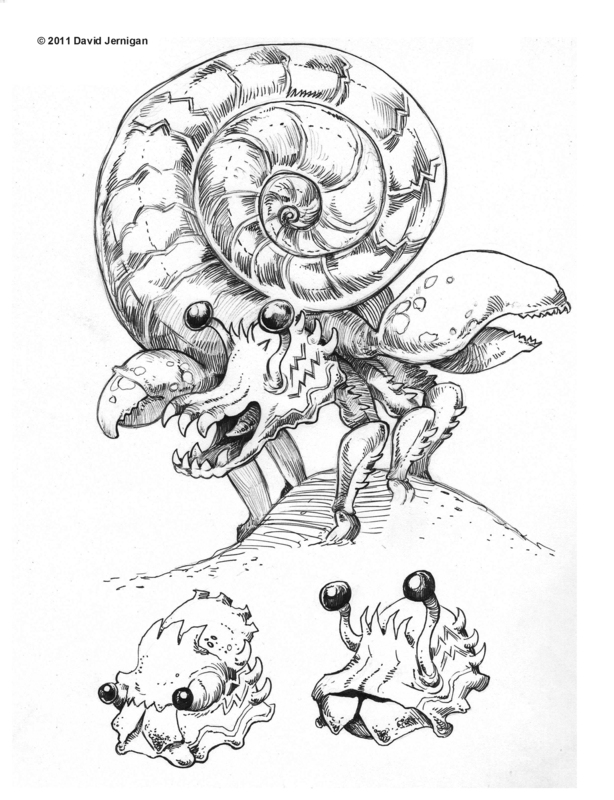 Monsters allow an illustrator to use their imagination and design skills with an undiminished intensity. They can be whimsical or utterly terrifying; they have a wide range of possibilities. This sketch is one in a series I did for a friend’s project. 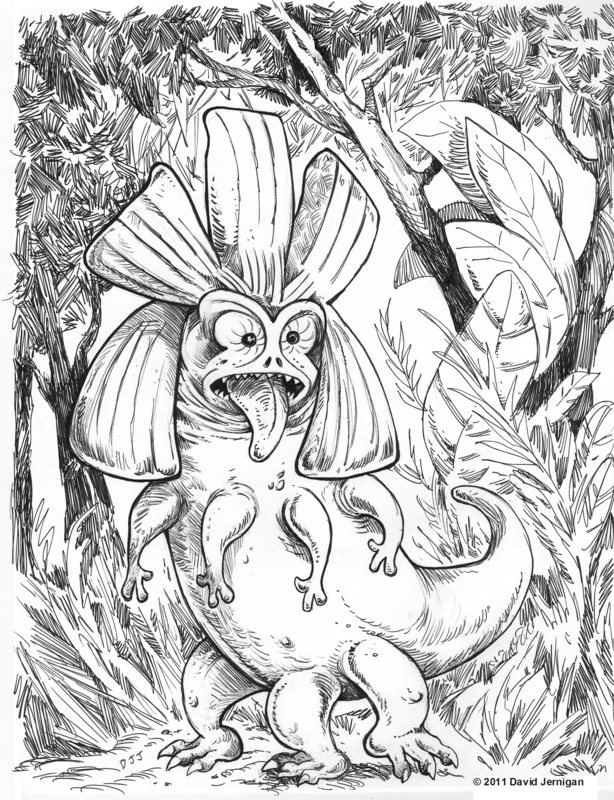 When I was drawing this monster, I imagined it could squirt poison out of it’s eyes, kind of like the Regal Horned Lizard that squirts blood out of its eye to scare predators. 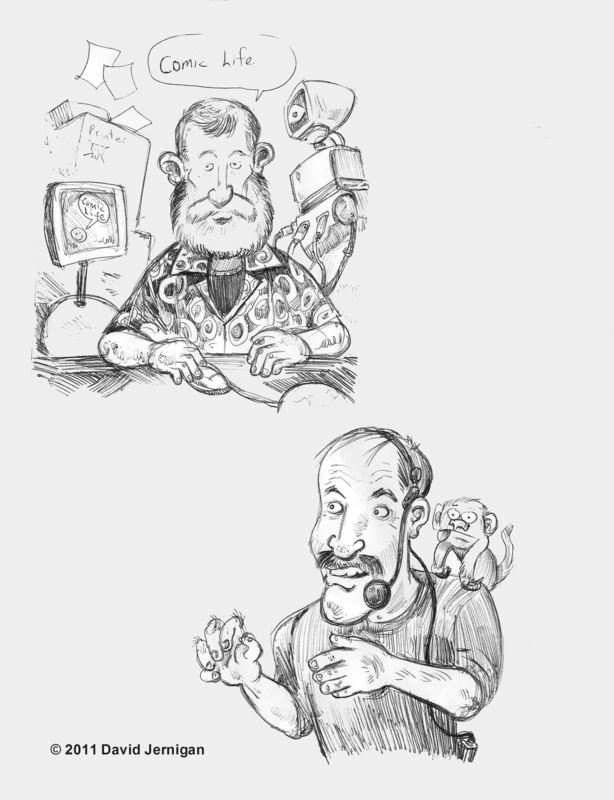 These two character sketches were drawn at a technology conference I attended for school. I used a cheap ball point pen to make the sketches. The pen was the only thing I had on me at the time. The fellow that looks a little like Santa Claus gave a presentation all about a fun software program called comic life. During the presentation he was very inanimate and never smiled. The fellow with the monkey on his back was the opposite. He was overly animated and kept saying how technology should not be considered a monkey on our backs; hence the monkey on his back. Hi folks! This here is my first post. 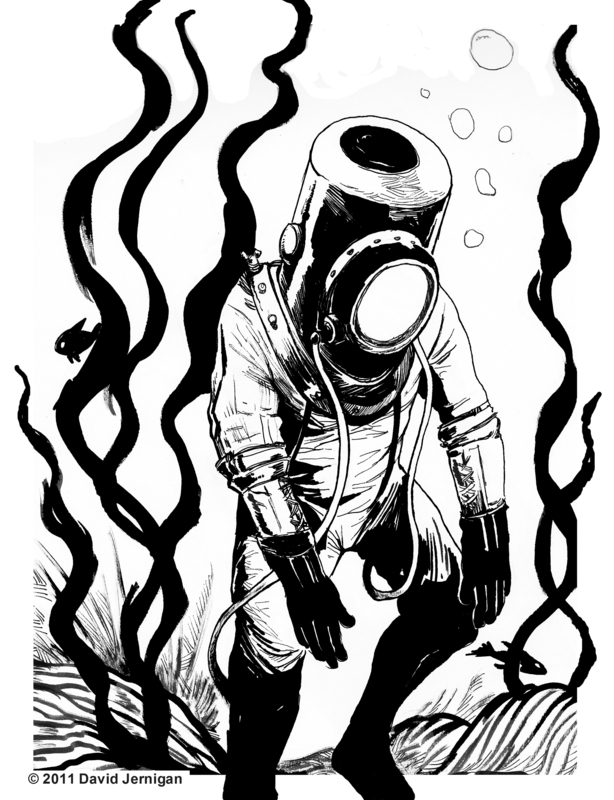 The drawing of the diver is from earlier this year based on an old photo from a trip to Washington DC. Using a photo of an old dive suit from the National Air and Space Museum for reference, I created the drawing with ink washes, pen and ink.